In this interactive study guide, New York Times bestselling author and beloved pastor Bishop T.D. Jakes helps aspiring entrepreneurs to transform their latent dreams into reality. Here are the practical, step by step tools, needed to ignite imagination into action--the perfect flight plan for launching the entrepreneurial drive inside each of us. 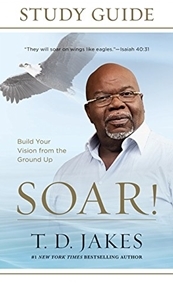 Each of the chapters corresponds with the chapters of Jakes' SOAR! expanding on its core themes and offering new strategies to encourage and equip readers in their entrepreneurial pursuits.